Kavita Vazirani is Executive Vice President, Insights & Measurement at NBCUniveral. In this newly created unified Ad Sales research division, Kavita is focused on aligning all of NBCUniversal's research, insights and measurement capabilities across all platforms and partnerships the company offers. Kavita oversees measurement and research initiatives across marketing and agency partners that go beyond traditional viewing patterns, and is building solutions that enable cross platform measurement, attribution and ROI to further deliver on clients' objectives to measure business outcomes. 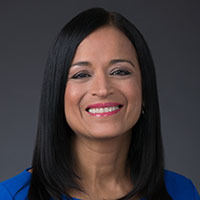 Prior to taking the role at NBCU, Kavita was Senior Vice President, Media Strategy & Sciences for Comcast Cable in Philadelphia, PA, the nation's leading provider of cable, entertainment and communications products and services. In this role, she was responsible for strategy development and placement of paid/owned media in excess of $1.5B across the Comcast portfolio (XFINITY, Comcast Business and Comcast Corporate) - with focus on optimizing spend and media mix optimization, as well as, measuring ROI through econometric modeling, attribution, and direct response measurement techniques. Kavita, who joined Comcast in 1997, has had several accomplishments in her 20 years tenure at Comcast. Her list of accolades include being one of the first ever recipients of the CTAM Rainmaker Award, Ad Age's Women to Watch, CableFax Magazine's Most Influential Minorities in Cable honor, OCA's Asian Pacific American Corporate Achievement Award, Cynopsis Media's Top Women in Digital Award, and AWNY's Advertising Working Mother of the Year honor. Kavita resides in Hatfield, PA with her husband and 3 children.